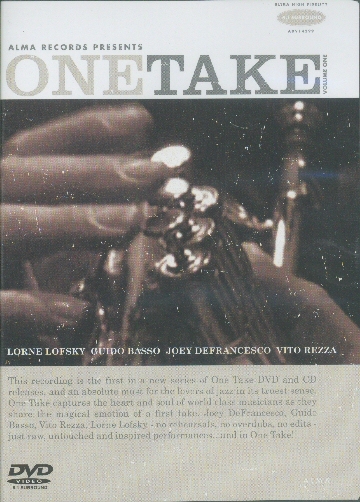 One Take - Volume One [one take dvd] : Jazz Record Center, Rare and out-of-print books, records and more. The first in a new series of 'One Take' DVDs. 'One Take' captures a Jam Session by world class musicians. Each performance is a 'first take', with no rehearsal, no edits, no overdubs-just raw, untouched and inspired performances. Features Joey DeFrancesco on Hammond B3 Organ, Guido Basso on Flugelhorn and Trumpet, Vito Rezza on Drums, and Lorne Lofsky on Guitar.